Luke 10:27 (AMP) – You must love the Lord your God with all your heart and with all your soul and with all your strength and with all your mind; and your neighbor as yourself. Romans 5:8 (NIV) – But God demonstrates his own love for us in this: While we were still sinners, Christ died for us. John 3:16 (ESV) – For God so loved the world, that he gave his only Son, that whoever believes in him should not perish but have eternal life. Proverbs 8:17 (CEB) – I love those who love me; those who seek me will find me. 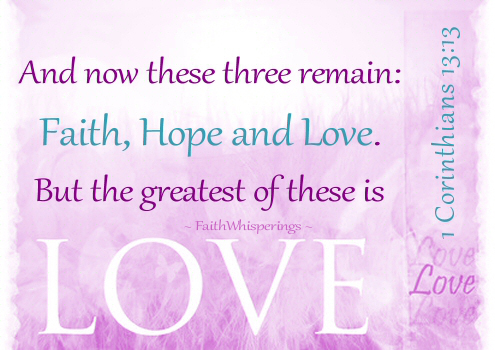 1 Peter 4:8 (NLT) – Most important of all, continue to show deep love for each other, for love covers a multitude of sins.